Monday – Thursday: 9:30 a.m. – 3:30 p.m.
Nancy café caters to the MICA family and also welcomes residents from the Station North neighborhood and beyond. 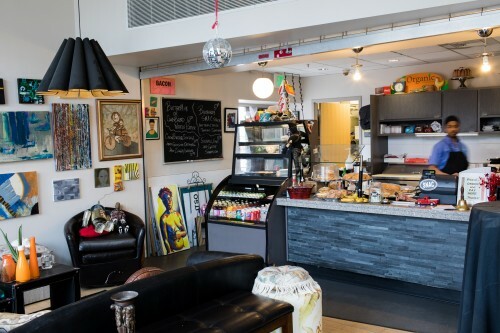 Named for the MICA supporter Nancy Haragan, Nancy café is located on the first floor of the Fred Lazarus IV Center for Graduate Studies adjacent to the Sheila & Richard Riggs Gallery. Its construction was made possible through the support of long-time MICA trustee M. Gwen Davidson. Nancy offers breakfast, freshly-prepared lunch items and desserts along with coffee, tea and other drinks. 1501 W Mount Royal Ave.